Built in 1910, Casa Nina has since been renovated to incorporate modern conveniences to ensure a comfortable and relaxing holiday. 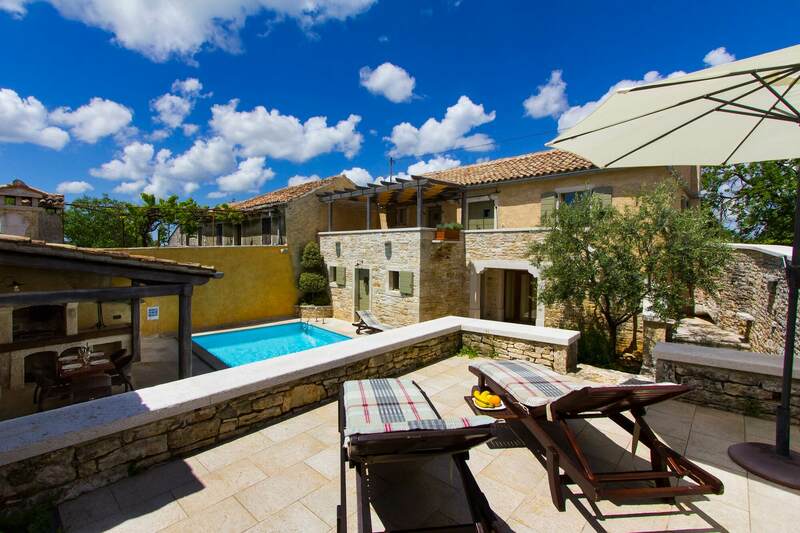 Stone and exposed beam features throughout the house lend a rustic feel to this Istrian gem; while the handcrafted furniture, decor, and amenities make for a luxurious and memorable stay. Many of our guests return year after year to enjoy the peace and serenity that Casa Nina, villa with pool has to offer. This warm and welcoming two bedroom, three and one-half bath comfortably sleeps five. Spectacular views of the surrounding green landscape can be seen from the private veranda located off of the master bedroom suite. High walls enclose Casa Nina and her courtyard that includes a swimming pool, sauna, shaded terrace, and flower garden. Air conditioning can be found throughout the house. Whether you are curled up by the fireplace in the spacious living room or lounging poolside, this home provides a relaxing retreat from fast-paced life. The Mediterranean climate makes Casa Nina a desirable year-around destination. Located in the village of Prkačini, you are placed in a central locale to explore everything that Istria has to offer; sunbathe on white pebble beaches, admire medieval architecture, tour local vineyards, and sample our world-renowned olive oil. Spend your next vacation de-stressing at Casa Nina!